Globalization and technology has changed education. With these changes comes changes in teaching and learning. 1) The National Council for History Education (NCHE) believes that historical thinking develops a unique capacity to comprehend human situations, challenges and interactions. Thinking historically introduces students to the wonders of the past and fosters the ability to make judgments about the present. History’s Habits of Mind articulates this distinctive approach, one that leads towards engaging with and understanding the contemporary world and serves as a foundation for life-long, productive learning and active citizenship. 2) National Council for the Social Studies (NCSS) The revised standards, National Curriculum Standards for Social Studies: A Framework for Teaching, Learning, and Assessment, were developed by a Task Force of the National Council for the Social Studies, and approved by the NCSS Board of Directors in March 2010. The realities of global interdependence require an understanding of the increasingly important and diverse global connections among world societies. This theme prepares students to study issues arising from globalization. It typically appears in units or courses dealing with geography, culture, economics, history, political science, government, and technology. Global connections have intensified and accelerated the changes faced at the local, national, and international levels. The effects are evident in rapidly changing social, economic, and political institutions and systems. The realities of global interdependence require deeper understanding of the increasing and diverse global connections among world societies and regions. 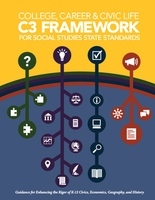 3) College, Career, and Civic Life (C3) Framework for Social Studies State Standards Understanding and evaluating change and continuity over time, and making appropriate use of historical evidence in answering questions and developing arguments about the past. It involves going beyond simply asking, “What happened when?” to evaluating why and how events occurred and developments unfolded. It involves locating and assessing historical sources of many different types to understand the contexts of given historical eras and the perspectives of different individuals and groups within geographic units that range from the local to the global. Global-scale issues and problems cannot be resolved without extensive collaboration among the world’s peoples, nations, and economic organizations. Asking and answering questions about global inter-connections and spatial patterns are a necessary part of geographic reasoning. 5) The College Board, AP U.S. History (APUSH) The revised course includes 7 themes for students to explore. These themes focus on major historical issues and changes, helping students connect the historical content they study to broad developments and processes that have emerged over centuries in what has become the United States. One theme, America in the World, focuses on the interactions between nations that affected North American history in the colonial period, and on the influence of the United States on world affairs. 6) International Baccalaureate Organization (IBO) – Group 3 History The Diploma Program’s history course aims to promote an understanding of history as a discipline, including the nature and diversity of its sources, methods and interpretations. It also helps students to gain a better understanding of the present through critical reflection upon the past…The course provides both structure and flexibility, fostering an understanding of major historical events in a global context. It requires students to make comparisons between similar and dissimilar solutions to common human situations, whether they be political, economic or social. It invites comparisons between, but not judgments of, different cultures, political systems and national traditions.